In the report, we present a sustainability filter that local governments can use to determine whether Sharing Economy activities advance multiple facets of urban sustainability. Sustainability is defined as advancing quality of life for all equitably while living within ecological means. 3) to respond to a growing interest in viewing the Sharing Economy from a sustainability perspective. The sustainability filter is applied to five sectors of the Sharing Economy of greatest interest to our local government project advisors. Shared mobility, spaces and goods are covered in the greatest depth, and then shared food and energy are given an initial analysis with less detail. Sustainability impacts across all areas of the filter are summarized first and then we provide recommendations for advancing urban sustainability, including some that advise local governments on how to get ahead of the curve. We also address Community Sharing, which was identified as a priority area for local government involvement to advance sustainability. Community Sharing innovators are focused at local or neighbourhood scales and currently use information technology more modestly while placing more emphasis on in-person connections and meeting community needs and sustainability goals. Non-monetized transactions dominate. Why is a filter needed? But without thoughtful checks, it could also…. 1. Living within ecological means - Does the Sharing Economy activity support absolute reductions in energy and materials flows to live within our ecological means? 2. 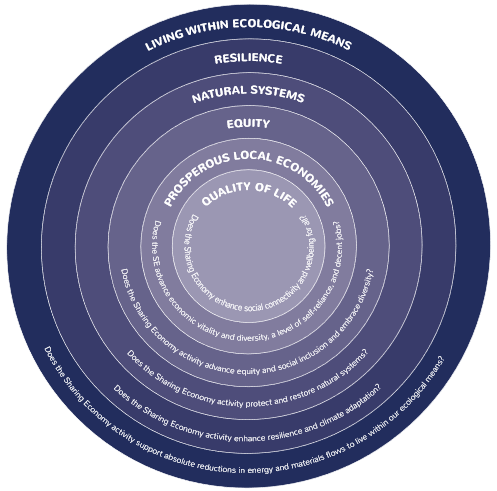 Resilience - Does the Sharing Economy activity enhance resilience and climate adaptation? 3. Natural systems - Does the Sharing Economy activity protect and restore natural systems? 4. Equity - Does the Sharing Economy activity advance equity and social inclusion and embrace diversity? 5. Prosperous local economies - Does the Sharing Economy activity advance economic vitality and diversity, a level of self-reliance, and decent jobs? 6. Quality of life - Does the Sharing Economy enhance social connectivity and wellbeing for all? Use terms and approaches that align with city priorities and interests. Even though we advocate for an integrated and comprehensive approach to sustainability, city priorities differ from place to place depending on political cycles and community needs. Our suggestion is for local governments to align their decision-making according to their city’s most pressing goals or priorities. If a city is focused on overcoming isolation among its residents then Sharing Economy activities that promote social connection can be prioritized. However, if addressing economic downturn is paramount, then Sharing Economy activities that promote affordable living and create quality jobs can instead be favoured by local government.